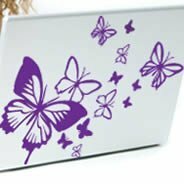 Fancy skin decals to accent and protect your laptop, tablet and cell phone. 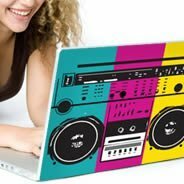 We understand that just like you need your house and clothes to show your own character and style; you need your laptop, cell phone and portable devices to have your distinct touch as well. After all, they are your most important devices! You probably feel naked without them. That is why we worked very hard to create an extensive collection of self-adhesive skins for your electronics. 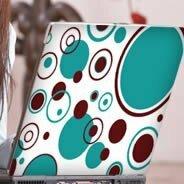 Our collection includes designs for all tastes and ages fitting a wide range of Ipads, Iphones and Laptops, so you can find one that is perfect for you. 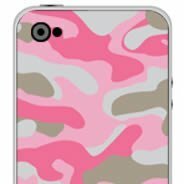 From animal prints, flag prints, cassette tapes, camouflage designs, skulls, polka dots and even chocolate bars – we carry it all! Browse through our selection and dress up your device! Also, if for some reason you can’t find a skin that pleases you or you are looking for a particular or exclusive design, you have the option to customize your own skin decals. Upload a picture, fill out our form and let us do the rest. Our I-skins are much more than decorative; they are made of a high quality premium material that will also protect your devices from scratches and surface damage – they will probably last more than your electronic device. In addition to that, they can be easily removed whenever you are ready for a new look.